Vada Pav: Vada Pav is a popular Indian fast food dish. 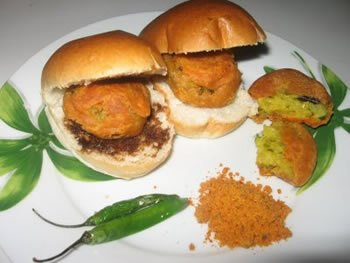 A Vada Pav is a popular spicy vegetarian fast food dish. It is native to the Maharashtra state in India. The name itself refers to a vada, which is a fried potato fritter, and a pav, essentially an unsweetened Indian bread bun. It is also popularly known as the Indian Burger. How is a Vada Pav made? The recipe and preparation of a vada pav is pretty standard. First, the potatoes are boiled and mashed. Finely cut green chilies and ginger are then added to the mash. The next step is to prepare a phodani, which is a tempering of mustard seeds, turmeric and salt. This is also added to the mixture. The mash is then shaped as a patty and covered with a seasoned batter of gram flour. The batter is made via gram flour and water, and seasoned with cumin power, red chilli powder and salt. Other spices may be added as per the individual’s taste. The patty is then deep-fried and served inbetween the pav. The vada pav can be eaten as this, or it can be served with dry garlic chutney, sweet tamarind chutney and/or fried green chilies. Jumbo King is one of the most popular sellers of vada pav. It is a chain of fast food restaurants that is primarily based in Mumbai. The company was inspired by the fast food business model of McDonald's and Burger King. They have a variety of different vada pavs, which cater to many tastes, including the cheese vada pav, the grilled vada pav, the Chinese vada pav, crispy veg vada pav, etc. Jumbo King started off with one outlet in Malad, Mumbai, but has gone on to become India's largest vada pav vendor. Prior to Jumbo King, street vendors would prepare vada pavs fresh on their carts and sell them at peak snack times. However, Jumbo King sells them throughout the day and at a varying price range. Jumbo King has become an alternative for people and has helped make the dish popular throughout the classes. This is mainly because, as a chain of restaurants, people expect to get a hygienic alternative than the street vendors, even if they have to pay more for it. Jain Vada Pav: Jain people usually refrain from eating potatoes, however that shouldn’t stop them from enjoying the Vada Pav. This variation is made by smashing raw banana with curry leaves and mustard seeds. The rest of the process remains the same, i.e. it is covered with a seasoned gram flour batter and deep fried. Chinese Vada Pav: Essentially a traditional Vada Pav but with one prominent twist, in the form of schezuan sauce. The version sold at Jumbo King is served with onions and chillies. Chicken Vada Pav: Of course, the non-vegetarians are not going to be left behind. They have come up with their own variation. The chicken vada pav is essentially a mash of spiced potatoes, herbs, and boiled chicken strips, which is coated in a light batter of whisked eggs and gently shallow fried. It is usually served with spicy green chutney, and loads of lime and onion slices. 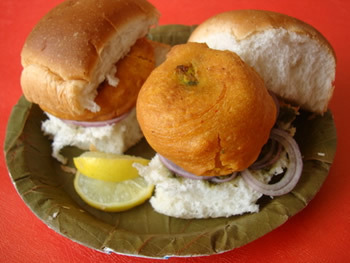 This type of vada pav is popularly known as Shami. Crispy Veg Vada Pav: This version has a crispier patty, which is achieved by covering the patty with breadcrumbs before frying it. The version sold at Jumbo King is served in a toasted bun, with sliced onions, shredded cabbage, thinly sliced tomatoes and mayonnaise. August 23rd is considered to be World Vada Pav Day. The vada pav is considered to be the poor man’s food, as it is one of the cheapest sources of sustenance available. The vada pav has gained a following among the social classes, mainly due to hygienic vada pav alternatives in the form of Jumbo King.